One great way to enjoy more time outdoors is to make your outdoor spaces useful, attractive, and functional! Here are 46 Awesome DIY Projects for Outdoor Spaces that will help you to create a personalized oasis on your property. Some are so simple you’ll wonder why you didn’t think of them. Make a beautiful Living Wall Planter on a fence or porch wall. Rot-Resistant Raised Planter Beds are a great way to get your garden started! A Scalloped Planter Box Centerpiece would be a beautiful addition to a patio table. Make your own Planter from an Ice Bucket to display beautiful flowers on your porch. This Utensil Holder for patio umbrella is a great addition when hosting a party! These Mini Planters would work on any table or small outdoor shelf. 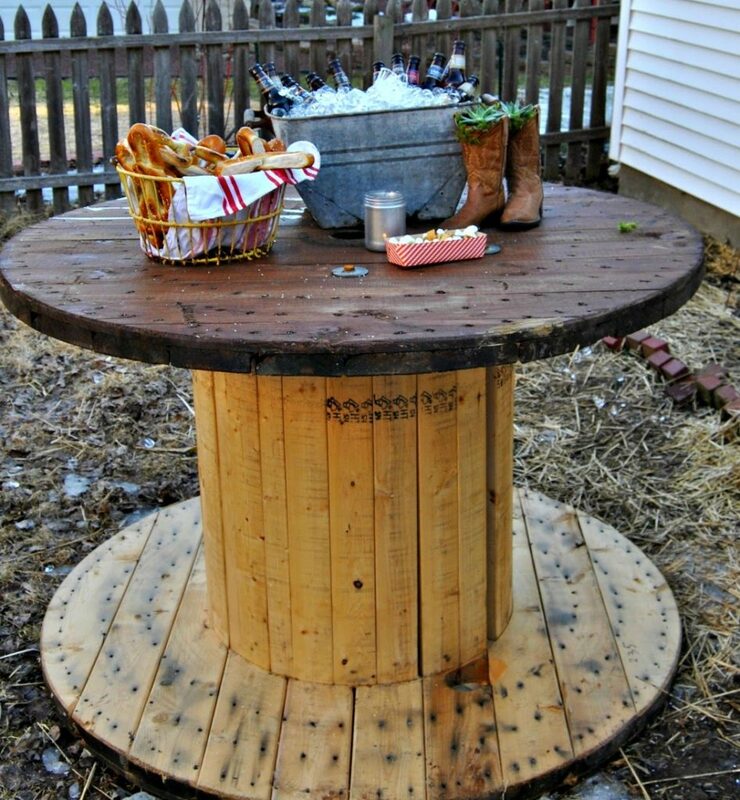 Make an Outdoor Beer Garden to add some fun to your next party! Build a Wood Storage Shed and enjoy s’mores around your fire pit without looking for more wood. This Marble Toss Game would entertain the kids during your next outdoor party! Dress Up a Patio Table for your next brunch. Turn a Bed Frame into a Patio Bench and curl up with a good book outside. Create an amazing Firepit and Outdoor Seating space to entertain all year long. A Fence Trellis is a gorgeous way to turn those climbing plants into art. This Giant Mandala Tattoo is a unique way to beautify your deck. Use these Adirondack Chair Plans for more outdoor seating. Install a Gravel Patio for a great seating spot!. This Porch Swing from Pallet Wood is a perfect spot to enjoy the beauty of every season. Install Concrete Paver Edging around your flower beds. A Living Wall Lattice Privacy Screen provides beauty and some privacy from your neighbors. Build Garden Bed with Cucumber Trellis to keep your plants healthy and productive. An Air Conditioner Screen from Pallets will hide that hideous—but oh so necessary—appliance. Learn how to Install Low Voltage Landscape Lights along your walks for nighttime lighting. A DIY Sprinkler System can keep your landscaping thriving. This Washer Toss Game would be fun at your next barbecue! A Little Red Wagon Planter is a cute feature in any garden. Tile a Small Tabletop to add a pretty table to your patio. Re-Painting Metal Patio Chairs handles rust and keeps them fresh and new. A No Sew Tablecloth for Table with Umbrella will come in handy every night of the week. Scrap Wood Planter Boxes are quick and easy projects to make for your flowers. Repurpose Vintage Milk Jugs into Side Table for a farmhouse addition to your porch. Tips for Creating Knock Out Container Gardens will come in very handy this year. Make DIY Yard Dice and have fun rolling them with the kids. Learn How to Build a Rock Solid Gate and keep the dogs in or people out. Make some DIY Tall Fence Planters for just $10 each, they’ll look modern and sleek in your landscaping! Knowing How to Fix Window and Door Screens will save you lots of money. Check out this post for Inspiration for Backyard Landscaping this year. Create a gorgeous Large Farmhouse Style Planter for your back deck. Kids grown up? Make a Grown Up Swing Set and have more fun than the kids. Add some gorgeous color to your patio by making these Easy Upcycled Marimekko Tin Can Planters. Build a Pergola with Trellis Screens to hide your trash cans and add beauty to your walkway. Easy Solar Light Stands creates an inviting spot and they will keep those solar lights from falling over. Build a Rolling Plant Caddy so you don’t have to lift your heavy planters. Save money by learning how to Recover Outdoor Pillows and add some comfort to your outdoor space. A DIY Concrete and Wood Planter is a modern and sleek way to hold succulents for your porch or deck. This Indoor/Outdoor Dining Bench is perfect for some quick and easy seating. Make a DIY Hose Hiding Planter to keep your landscaping looking sharp. I hope you loved this roundup of DIY Projects for Outdoor Spaces! Which was your favorite? Share in the comments! Pin the image below for reference and show all your friends these great ideas! I was looking forward for summer to get here, now that it’s here, I am finding myself so behind in my plan to DIY projects. I love, love , love your backyard projects. Amazing!